Most people wouldn’t know what to do if they were invited to visit a temple. 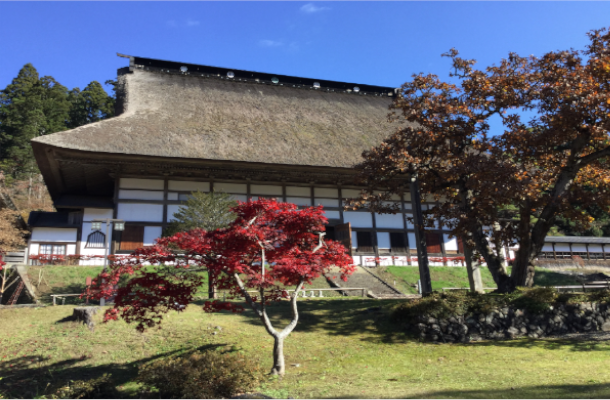 But nestled in the clear air of Iwate, Shoboji Temple offers visitors ample reason to visit. For just 500yen admission fee, you can explore the temple grounds and relax in the large hall sampling tea and snacks with your friends. Enjoying the pleasant atmosphere of Shoboji could be a new way of spending your day off. Another impressive feature of the temple is the great stone steps at the entrance to the main hall. According to legend, they were made that way to ensure equality, as even the most powerful lords had to dismount their horses and walk up the stairs on their own feet. *With prior booking, you can enjoy the unique experience of Buddhist shojin cuisine.